cakegrrl.blogspot.com: Piatti Sacramento Kicks off Summer Music Series on May 18th! Piatti Sacramento Kicks off Summer Music Series on May 18th! Long time supporter of cakegrrl.com and cavegrrl.com, Piatti Ristorante, kicks off their Summer Music Series this Saturday evening, May 18th, when they'll feature live music on the outdoor courtyard, 6:30pm-9:30pm. 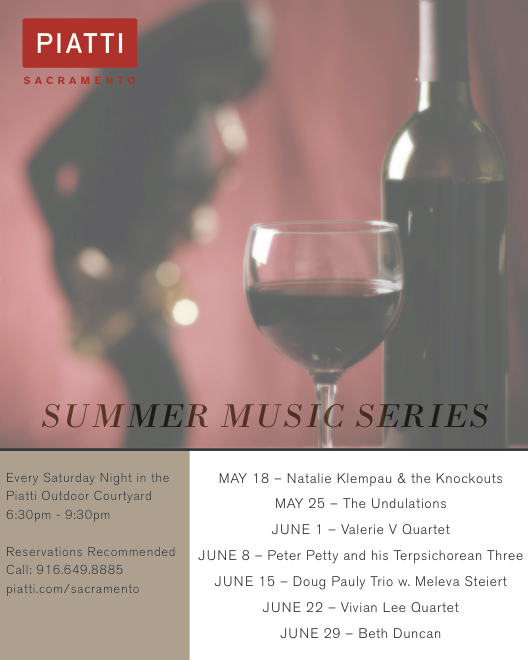 This Saturday, May 18th, Natalie Klempau & the Knockouts will perform. Enjoy your dinner alfresco, accompanied by local artists. May 25h: The Undulations, June 1st: Valerie V Quartet, June 8th: Peter Petty and his Terpsichorean Three, June 15th: Doug Pauly Trio w. Meleva Steiert, June 22nd: Vivian Lee Quartet and June 29th: Beth Duncan. You can find Piatti Sacramento on Facebook here and follow them on twitter here. Piatti Ristorante is located on Fair Oaks Boulevard in Sacramento.